It would not be a stretch to call Stax “the first audiophile headphone.” When almost all other full-sized headphones were using dynamic drivers, Stax had already established itself as preeminent by using planar-electrostatic technology. Stax’s technological advantage continued until fairly recently, when the headphone and portable audio business “blew up” into the most vibrant sector of high-performance audio. Unlike in the past when Stax was the only electrostatic option, nowadays audiophiles have their choice of planar designs from many other manufacturers. Obviously Stax noticed the increased competition, and with its SR-009 ($4450) introduced a new electrode structure that refined its original 36-year-old design—and that once again put Stax ahead of its competition. Unlike most earphones all Stax electrostatic earspeakers use special dedicated amplifiers to drive them. This increases the cost of a Stax system proportionately—with an SRM-007tII ($2150) tube driver unit, the cost of an SR-007 Mk2 system goes up to $4500, while the SR-009 increases to $6600. That puts them among the most expensive headphone systems currently available, and out of the reach of many audiophiles. Stax needed an earspeaker that used the new stator technology in a more affordable package, so it developed the SR-L700 ($1400). Combined with the SRM-007tII, an SR-L700 system runs $3650, and if you opt for a less expensive Stax driver unit, you could put together an SR-L700 system for as little as $2725 by using the SRM-006tS. I’ve been listening through Stax earspeakers since I got a pair of original Lambda Pros with an SRM-1 driver unit in the early 80s. I currently use a pair of Lambda Pro Nova Signature earspeakers with an SRM-007t driver amp. I also have several pairs of older Stax models including the SR-5, SRX Mk3, and the portable SRS-001 system. In 2013, I reviewed the SRS-4170 system ($1775), which included the SR-407 earspeakers and SRM-006tS amplifier. I found the SRS-4170 system more similar to than different from my older Stax system. Does the new SR-L700 up the ante sonically? Let’s find out. The SR-L700 utilizes the same “sound element” developed originally for the flagship SR-009. Stax calls this new ultra-thin polymer material “super engineering plastics.” The new Stax transducer also uses a special electrode scheme, which Stax named MLER (multilayer electrodes). Stax’s explanation on its website for this new technology loses something in the translation from whatever original language it was written in: “While infinite thinness and flatness are required for the fixed electrodes, they simultaneously need to have other characteristics such as low resonance, high transmissivity of sound wave, and so on. The entirely new electrodes have been completed through the unification of metal plates processed with ultra-precision photograph etching using the high technology of heat diffusion combination on the atomic level.” Obviously a dimension can’t be “infinite,” but Stax’s intention was to create a thinner, lighter, stronger diaphragm material coupled with a thinner, lighter, and more powerful electrode array, and it has succeeded on both counts. Where the SR-L700 differs from the SR-009 and SR-007 is that instead of the new round enclosure featured on those two models, the SR-L700 uses the traditionally shaped Stax Lambda Pro rectangular enclosure, headband, yoke, and earpads. But the SR-L700 enclosure is not the same dimension as previous Lambda models—it’s thicker. The added thickness was necessary to encompass the new electrostatic design. 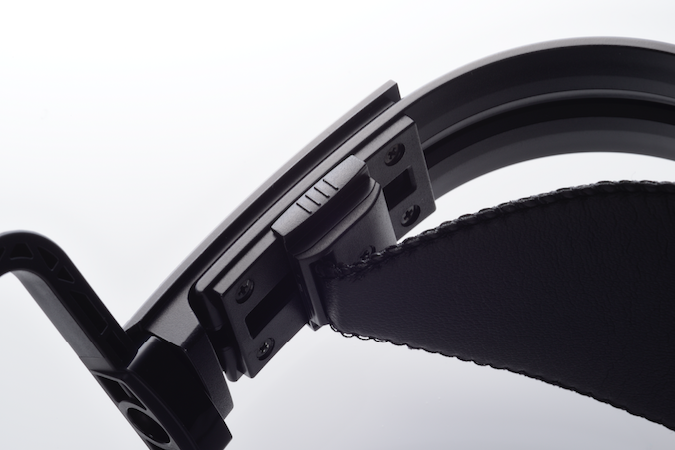 Stax added several other design changes for the SR-L700, including adopting the click-stop adjustments for the leather headband, making a more robust (but still plastic) yoke, and using new cushion material in the earpads. The permanently attached cable features 6N high-purity annealed-copper wire for core wires, and six silver-plated annealed-copper perimeter wires arranged in a wide parallel structure to lower the overall capacitance. I used the Stax SR-L700 earspeakers with several Stax driver amplifiers including a current-production solid-state Stax SRM-727II and tube SRM-007tII, as well as my own, older units, the SRM-007t and SRM-1 Mk II. Most of my listening was done with these driver amplifiers connected to the Grace m9xx DAC/Pre via a 1/2-meter length of Kimber KCAG. A manufacturer could assemble the finest-sounding personal transducer ever made and if it doesn’t fit well, it’s sure to be a failure. The Stax Lambda Series has long been considered among the most comfortable headphone designs ever devised, and the SR-L700 continues this tradition. I found the SR-L700 fit me slightly better than my Stax Lambda Pro Nova earspeakers because the SR-L700’s click-stop adjustments (instead of the older friction-fit) insured that the headband’s length didn’t change after every use. I also liked the SR-L700 earpads better—they were slightly thicker and softer. The SR-L700’s clamping force was slightly greater than on the Lambda Pro Novas, but still had less pressure than the majority of headphones. On a scale of 1 to 10, if 1 was no pressure and 10 was getting your ears boxed by a big strong guy, the SR-L700s clock in at a 2.5. You can (and I did) wear them for hours on end with no discomfort.